Combine Knorr Chicken Bouillon Cube and next 4 ingredients. Place chicken in a large plastic bag and add Bouillon mixture. Close bag and marinate in refrigerator for 30 minutes. 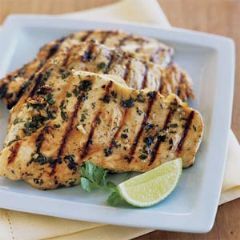 Remove chicken from marinade, discarding marinade. Grill or broil chicken about 6 minutes or until thoroughly cooked, turning once.